Recently I had the opportunity to take the Successful Homeschooling Made Easy Course from Successful Homeschooling Made Easy. While we've been homeschooling for three and a half years now, I am always looking for methods to make our days run smoother and more efficiently. 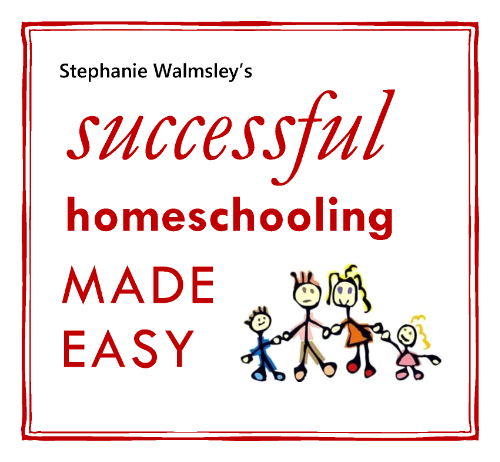 Successful Homeschooling Made Easy is an online course, delivered directly to your email inbox, for 26 weeks! Each lesson comes as a PDF file that can be viewed on just about any device. There is no need to wait for a new group class to begin either. Upon signing up your very first lesson will be almost immediately delivered to your email. A new lesson then follows each week. For the purpose of the review I was given a subscription to the entire weekly course. Every lesson has a little bit of homework (don't worry it's easy) that helps guide you through the process of beginning or adjusting your homeschool. The purpose of the majority of the homework is to help the parent organize their thoughts regarding education and why they are choosing homeschooling. The course explains how to set up your daily schedule and learn to keep that schedule going. So many homeschoolers often mention how difficult it is to stay on schedule because it is extremely easy to be side tracked by life. These lessons provide very detailed instructions on how to help you keep your days on track without being a slave to a minute by minute schedule. The lessons also provide hints and helps to prevent burn out. Frequently, homeschooling parents forget to care for themselves as well as their children. There is an entire week of this course devoted to not only the physical care of the homeschooling parent, but also to assisting the parent in finding their passion in life. 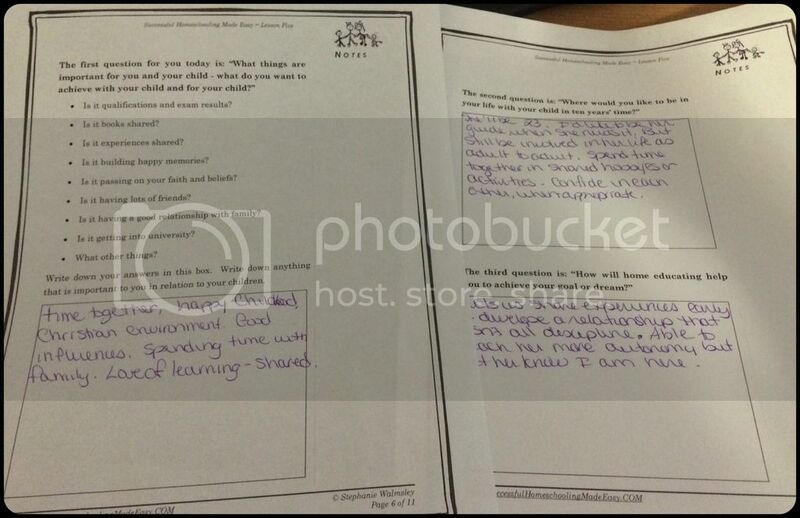 Then, there is the worry of homeschool parents everywhere: did I select a proper curriculum? And what schooling method should I choose? Successful Homeschooling Made Easy addresses the major types of schooling and the use of curriculum. That particular lesson really helps to drive home the idea that curriculum is merely a tool. I chose to read my lessons each week on my iPad, mostly during my workout times, but also while I waited for my daughter at her flute lessons. These were both quiet, alone times where I could concentrate on the material and really think about the homework questions. I did not print out every assignment, but there were several I chose to print so I could write out the answers for more mental clarity. Occasionally the homework is simply to educate yourself further on the topic of homeschooling. One particular lesson includes several homeschooling books with a link to even more books the author recommends. Personally, I did not read any of the books listed during the course since I had already read several of them when we first considered homeschooling almost 4 years ago. I did quite a bit of research before we embarked on our homeschool life, and would have loved a resource like this course that brings everything together in one place when we were so desperate to make our homeschooling decision. 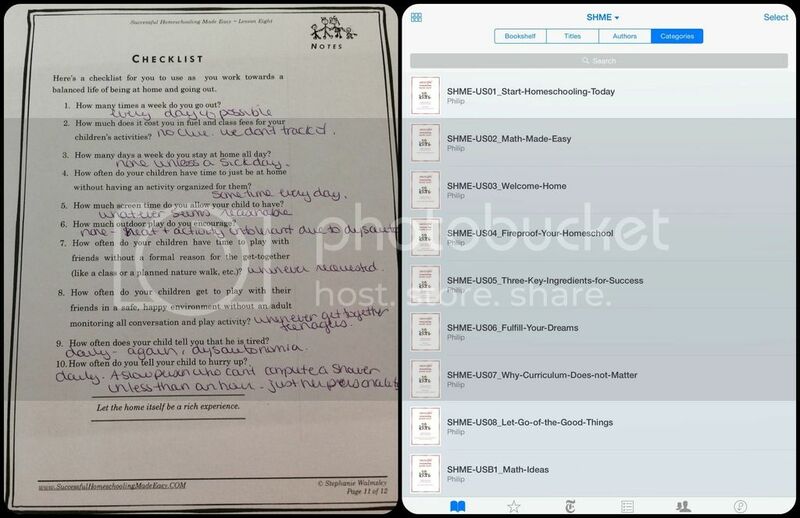 While I definitely would have been excited for the information provided in the course during our early days of homeschooling, the slow approach to building a schedule encouraged in these lessons might have been a problem for us. The course promotes gradually adding subjects to the schedule over many weeks, however our state has core hour requirements that must be met within a set school year time frame. When switching to homeschooling during a school year, as we did a few weeks into second semester, it is even harder to drop everything for several weeks and still meet the required core hours for that semester. This approach might be more successful for those beginning their homeschool at the start of a school year. I also found the course to make some broad generalizations in priorities and be geared towards an average family. Yet our family has a child with chronic illness which makes setting a daily schedule, as the course find so valuable, not possible given the ups and downs that come with illness and a multitude of doctors' appointments. Years ago we did thrive on a regular schedule and might have agreed with the importance of such a schedule, but now it would be too constraining for our needs. I do think this course is perfect for new homeschoolers or a family still considering homeschooling. It explains how to start in a calm and easy way that will prevent the parents and children from feeling overwhelmed. It also addresses how to deal with the ever growing pressure to put your child into as many activities as possible to ensure socialization. All this on top of the wealth of additional resources provided in the course, as well as explaining ways to prevent the various pitfalls homeschool families often fall into over time. Overall, I think this course would be great investment for those in the early stage of homeschooling. Since we are all in different places in our homeschooling time, please check out what other members of the Review Crew thought of Successful Homeschooling Made Easy!